The day Savannah was born I was fully expecting to give her a binky (or a pacifier as my husband loves to correct me). That all changed when my hubby approached me to let me know that it was important to him for us to try to go without one so I agreed to try. I think it was the next day when we threw in the towel and let her have a binky which quickly soothed her to sleep for many days and nights to follow. For about a year the binky would be there to comfort my sweet baby girl and also keep her from screaming in church. It had become my right hand man in many situations but I always knew that the day of the binky would eventually have to come to an end. That dreaded day finally came on Sunday March 16, 2014 around 6:30 pm (Savannah is 14 months old). It was not planned. There was no binky to be found in any of the hiding places (she was only allowed to have a binky when she was asleep so we kept them out of reach the rest of the time). Panic struck but we were determined to approach this next phase of our daughter’s life with her no matter how difficult it might become. As my husband put her down I was squirming in my seat anticipating a rough night ahead. As he left the room and closed the door the crying began. My heart dropped because I knew she would easily be comforted by a binky, the item of security that I had just taken away from her. Relief soon came over us though as only a couple minutes after being put down Savannah had fallen asleep, without a binky. I was so proud and happy that my daughter did so well with this transition because I know many babies struggle with it. So far it has been about a week since the no binky rule has been in place and I can honestly say that I have only been tempted one or two times to give in but have stayed strong for my daughter, husband and myself. 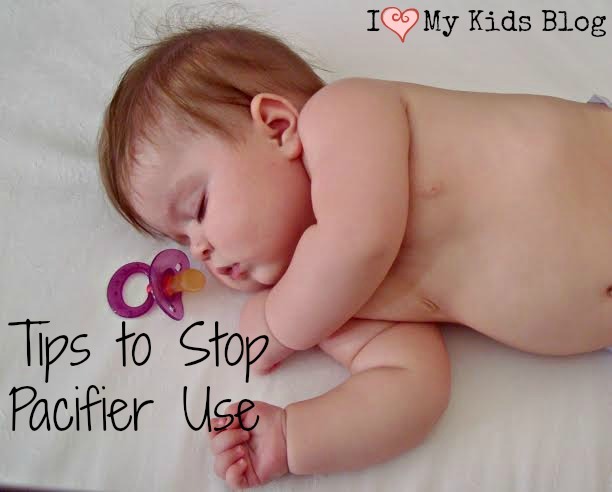 Of course every child is different, even those within the same family, so below I will list some other strategies how to stop pacifier that other parents have used in this situation, besides the “cold turkey” strategy that my husband and I used. -One strategy that I think also played a part in how easily Savannah did was to just let the child tell you when they are ready to be done. A sign that I could tell that Savannah was ready for this transition was that a lot of the time when going to sleep she would end up losing her binky outside of the crib and still be able to fall asleep. Some other ways that your child might let you know that they are ready is if they continuously spit the binky out when it is put in their mouth or some babies will even walk up to the trash can and throw it away (It can’t get more obvious than that). -Another strategy that I heard of before even looking into this topic was to just cut off the tip of the binky so even if they still wanted it, it would be no good to them anymore since they would not be able to even use it. -A strategy that would work great for toddlers is one I had never heard of until this week. It is called the Binky Fairy. First you have your child gather all their binkies and place them in a bag. You then place that bag in a location out of site from you toddler, like down the street or in the garage. Next the “binky fairy” (yourself, spouse, a friend, or whoever) will take the bag and replace it with a prize (like a stuffed animal, something that can replace the comfort of a binky during sleeping times). I thought this was such a great idea! These are only a few ideas though. There are so many more ways to go about this and don’t get discouraged if you can’t get it on the first try, just keep trying new things and eventually you will win the binky battle! What are your best strategies or tips for helping your child get off a binky? Was it difficult for your lil one? Also at what age did you stop pacifier? We tied ours to a bunch of balloons and let them float to heaven for the babies in heaven that needed them. Not my idea, heard it from another mom. I also know this one. Susan Urban made a really good work collecting all this methods. It is very helpful to choose the best method for you and your kid 🙂 We did the reward chart method. The reward chart method is such a good one and can be used for so many different things. That is the method we have used when we potty trained two of our kids. I will have to check out Susan Urban’s work, thanks for the recommendation! There are so many methods! What is the three step method you are using? How is it going so far? Those are great ideas! I am pretty sure the animal stuffing idea can be done at Build A Bear. I love that idea cause it let’s them know that they still have it close and they now have something new to help comfort them. Thank you for the comment!